Day four of our travels was my second full conference day and I woke up EXHAUSTED. I knew that straddling the time zone we came from while living in the one we were in (three hours ahead) was catching up to me. I also noticed I was looking pretty puffy in the photos we’d been taking so I needed to be more conscious about drinking more water. I needed to get myself together! I dragged out of bed and we headed back down to the track. 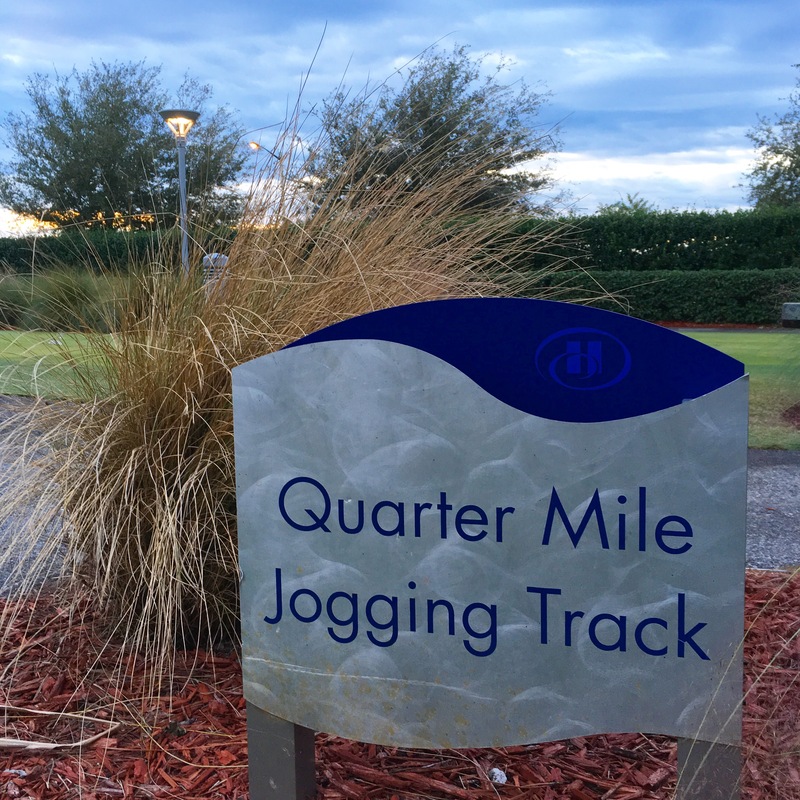 I knew that getting a run in would help me start to feel better. And it did. My head cleared, I brightened up a little. REAL TALK: we have barely had a decent cup of coffee since we landed in Florida. Starbucks seems almost non-existent and the hotel coffee so far has been, well, decidedly un-west coast. Here are some of the luxuries that we enjoy living on the west coast. Travel has taught me that we are really lucky to have these things and I sometimes have to remind myself of that. Healthy food. If you think being a vegetarian or gluten-free or low carb or whatever is tough in Vancouver, it is a LOT more challenging outside of it. I’ve been on trips when literally the only thing I’ve seen that I’ve been able to eat was green salads and sometimes even they have required some negotiation. Most major cities are coming around, but plan to step outside and I’d recommend you pack a few of your own essentials. (Both conference hotels have done a great job of providing healthy and interesting selections of food. Good coffee. It isn’t the best in the world, I’m sure, and not every cup is perfection, BUT the close proximity of Starbucks’ origin certainly raised the bar as far as what west coasters were willing to accept. The tea drinkers attached themselves to the cause and they forced tea providers to up their game as well. If you’ve ever asked “what kind of tea do you have?” and been met with a blank stare or a stammering, “uh, Red Rose?” then you know what I’m talking about. Free and accessible wifi. Everyone has it. I dare say that it has become our expectation. From community centres to entire cities, we have wifi and we share it with everyone. I saw this in Europe and, again, in some major cities (props to Vegas, especially and Irlando has also been great) but I learned to check that FREE wifi is listed as a feature before I confirm any hotel. I learned that the hard way. And wifi is one thing that it really irks me to have to pay for. Lunchtime was pretty good again: Greek salad, farro salad, green beans, rice, citrus salmon with coconut rice pudding and chocolate mousse for dessert. Thumbs up all around. The afternoon was nice because not only did I get to two really great sessions, but I also got to see a couple of people I really like and call friends. An extra reward from attending an event like KronosWorks: meeting new people from all over the world. We snacked on trail mix and fruit during our afternoon break and the conference started to buzz with anticipation of the big event that night: The Wizarding World of Harry Potter! Every year, there is one big event at the conference. 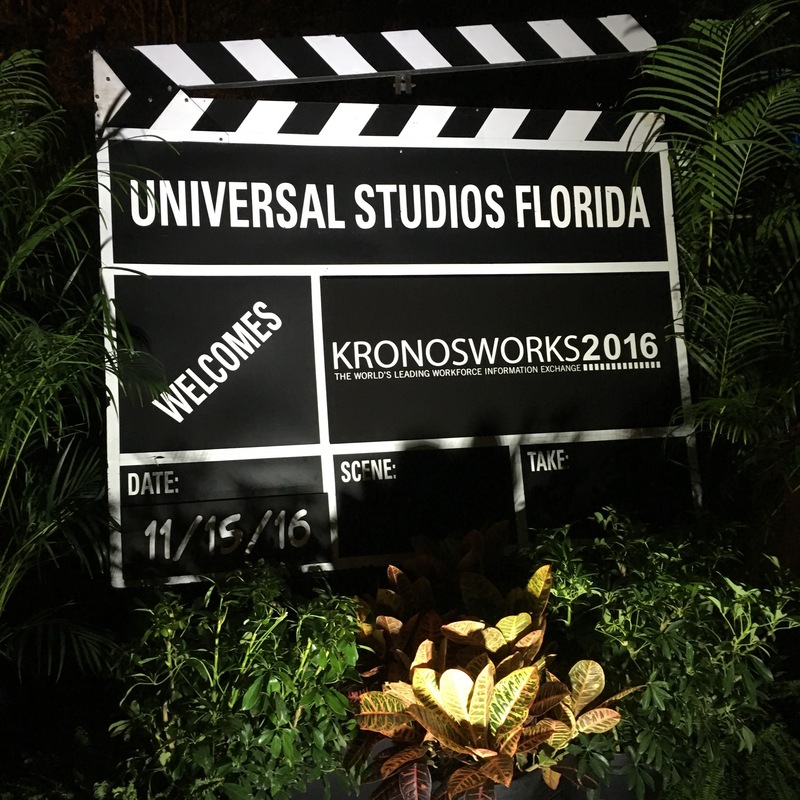 Similar to the customer dinners on day one, this event is a private event held in a great location and the Kronos team does a really amazing job of making it fun and special and something you won’t want to miss. This year, however, they outdid themselves. 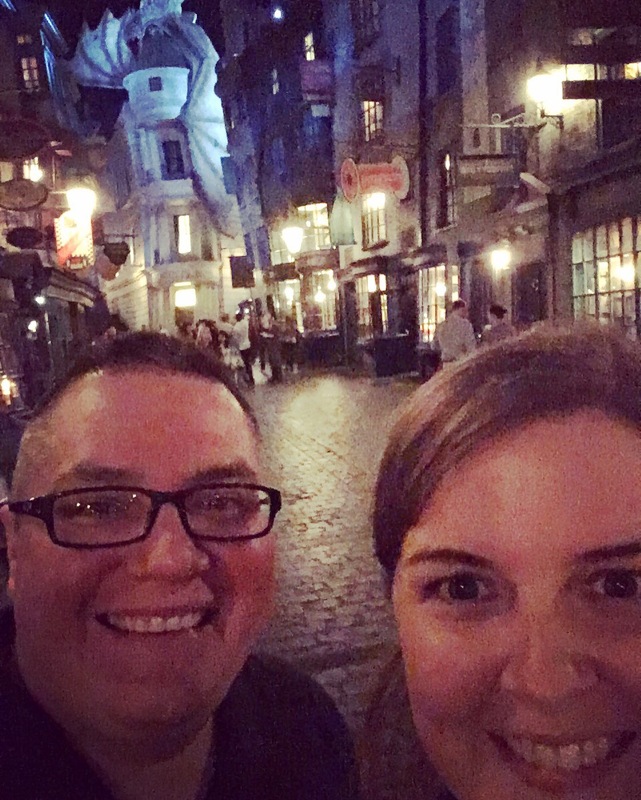 We were bussed from our hotels to Universal Studios where we had full private access to two lands that represent two major parts of Harry’s life: Diagon Alley and Hogsmeade. Each was located in a different one of Universal’s theme parks and we were able to move back and forth between them by taking a ride on the Hogwarts Express. Dinner and drinks were provided and available in many locations throughout both locations. We had different priorities, though. We were there to ride the rides, see the sights and to check out the shops. It turns out that we have many big Harry Potter fans in our lives, but some of the biggest are also the littlest people we know. And I told Kevin that I didn’t care about the food – we could eat anywhere, but we only have three hours at Harry Potter! 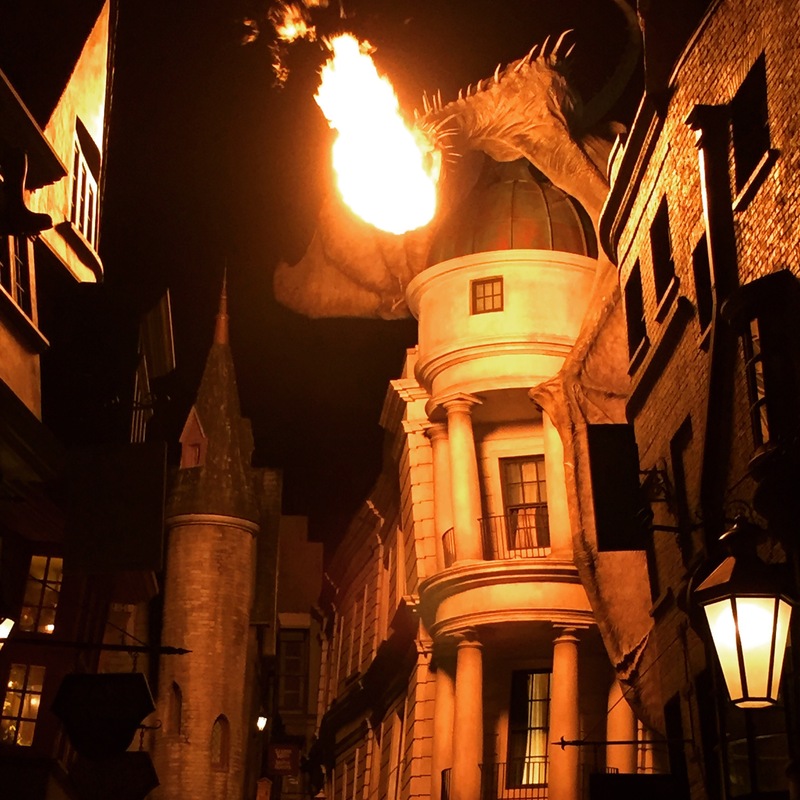 We started in Diagon Alley and wandered the cobblestone streets in awe and amazement alongside all the other guests who arrived with us. We saw a sweets shop and a robes shop and even a wands shop across the way. High above Gringott’s a dragon sat perched and it wasn’t long before she let out some huffs and puffs and blew fire just to let us know she was there. 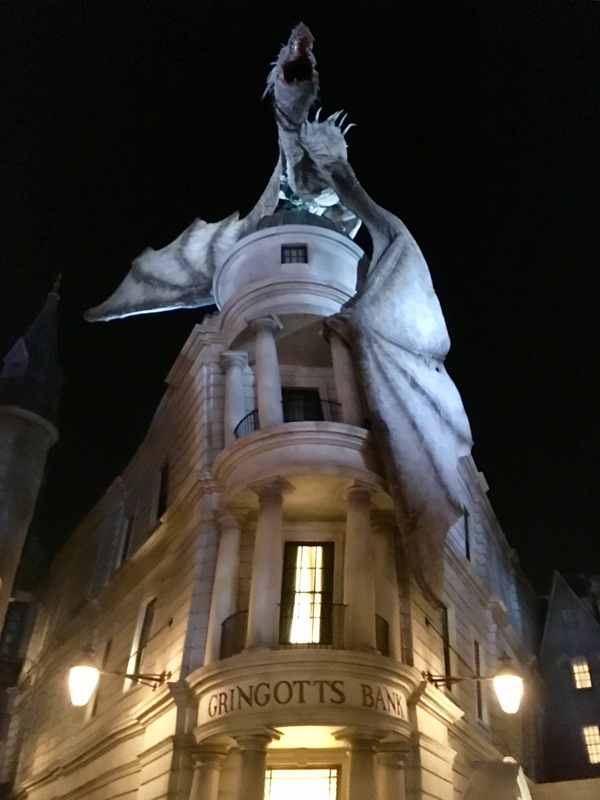 Our first decision point was to take our chances on the Escape from Gringott’s ride. We had to leave anything that could fit in our pockets behind and since I had a little wristlet with me, I was directed to a bank of lockers close by. Shout out to these lockers: as I found out, they are located all over the parks in areas close to rides that require them. They are free to rent for varying amounts of time or you can pay to have them for longer periods. Using a touch screen, you identify your need to rent a locker then using a finger scan, your are recorded into the system and a locker is assigned to you. Just open it up and put your stuff inside – it’s big enough for a pretty big purse or some shopping bags – then press a button and your belongings are secure. When you come back to collect, you just scan your finger at the same computer screen and your locker will open up for you. Just don’t forget your locker number. The two-point verification requires your locker number AND your finger scan. (There was an option on the screen for if you forgot your locker number, but we didn’t explore it.) Each locker is assigned to a specific touch screen so you can’t unlock one from a different station. I’d guess there are maybe 25 per station so even if you didn’t remember your number, you’ll likely remember it’s location and be able to sort it all out. Back to Escape from Gringott’s. It was so much fun! We had to walk quite a long way to get to the actual start of the ride. Some of that was through somewhat empty rooms where the metals railings where hundreds of people would normally be corralled while waiting to access the ride. It was a good reminder of how lucky we were to be there when and how we were. Other parts took us through the heart of the bank where goblin tellers counted and recorded some kind of stats we’d never know while occasionally focusing their beady little eyes on us as we walked by. 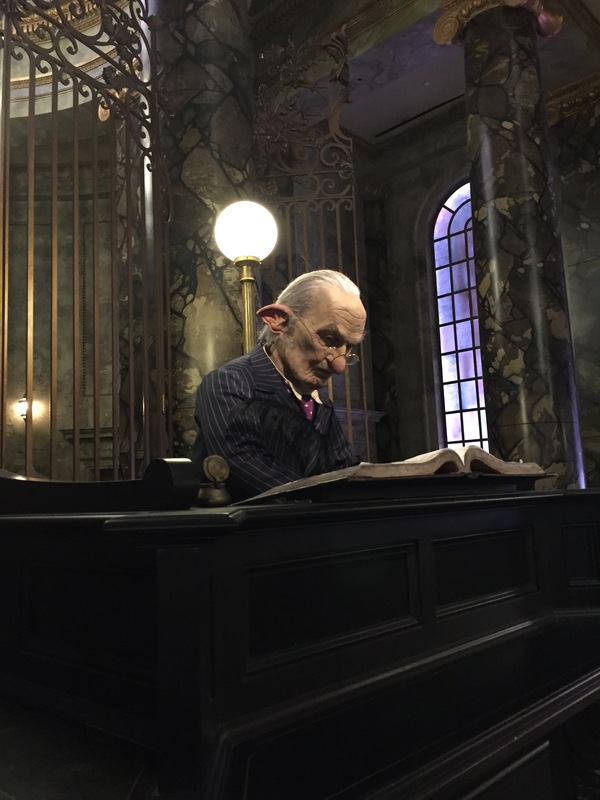 Eventually, we wound our way to a room where we witnessed a dramatic encounter was taking place between Bill Weasley and a goblin before being ushered into an elevator waiting room. Once the doors opened, we descended into the depths of the goblin bank. From there, there was another long walk to get our 3D glasses and then up several flights of stairs to the ride loading area. Once we were seated and strapped in, it was go time on 4.5 minutes of real roller coaster-ing combined with virtual roller coaster-ing, some spinning, some hot dragon breath and non-stop smiles and laughter. We returned to the platform clapping and cheering and everyone walked out chattering about how much fun it had been. We were high on adrenaline and it was at this point, we decided to head over to Hogsmeade where there were more rides. 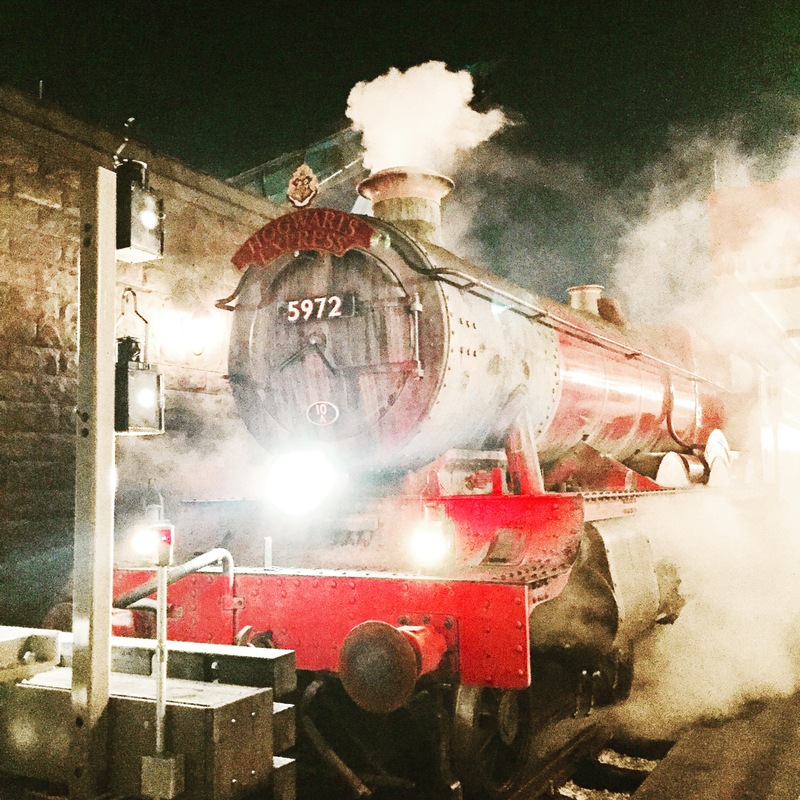 We made our way out of Diagon Alley and through King’s Cross Station to catch the next Hogwarts Express. This slowed things down significantly – it was really fun and exciting, but in more of a story telling kind of way. We were seated in a compartment and as we traveled, we saw images related to Harry leaving London for Hogwarts outside the window side of the train and silhouettes of Harry, Ron and Hermione talking and getting up to something in the aisle outside the compartment side. 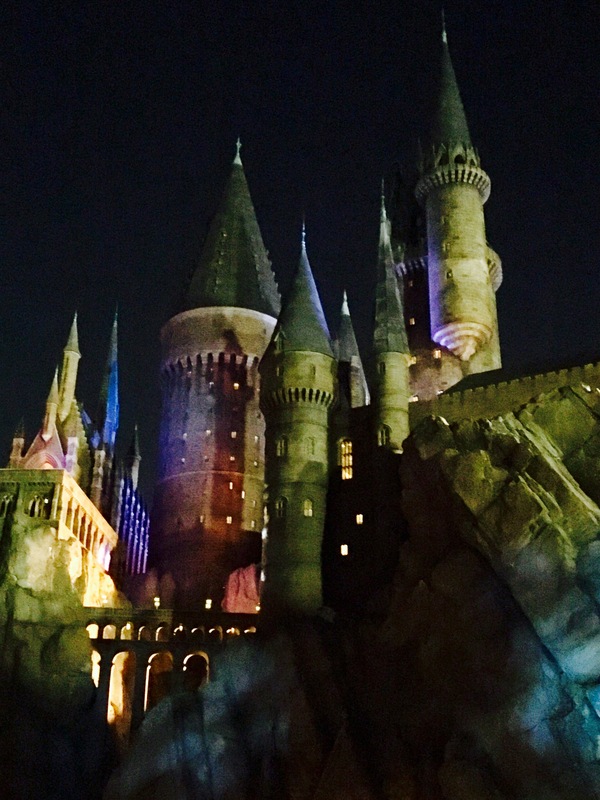 Moving on, we headed to Hogwarts where we roamed the castle and went on the Forbidden Journey ride. The walk to the loading area is a fun experience in itself and this was my favourite part of our visit. Call it whatever you want, flying through the skies and alongside Harry, through the Quidditch pitch and back to Hogwarts, it’s a super fun four plus minutes. Coming off Forbidden Journey, we were drunk on all things Harry Potter so we totally fell for the marketing scheme of making the exit a gift shop. We were so intent on shopping while we were at the park that we’d actually written a list of people we needed souvenirs for. I bought myself some knee-high Gryffindor socks and Kevin bought himself a really great Hogwarts golf shirt. Next up, we took the quick one-minute family-friendly roller coaster, Flight of the Hippogriff. It was cute and good for a few laughs, but exactly what it promised: family friendly. Fun, but not super thrilling. By now, we only had about an hour left in our night and we still had a few things to find and buy. We were too excited to be hungry so we hadn’t eaten. Every so often we grabbed some drinks – water for me and beer for Kevin. We were undecided about going back to Diagon Alley, but then talked to one of the hosts who told us that the story going from Hogsmeade to London is different than the story in the other direction so we decided to take another train ride. 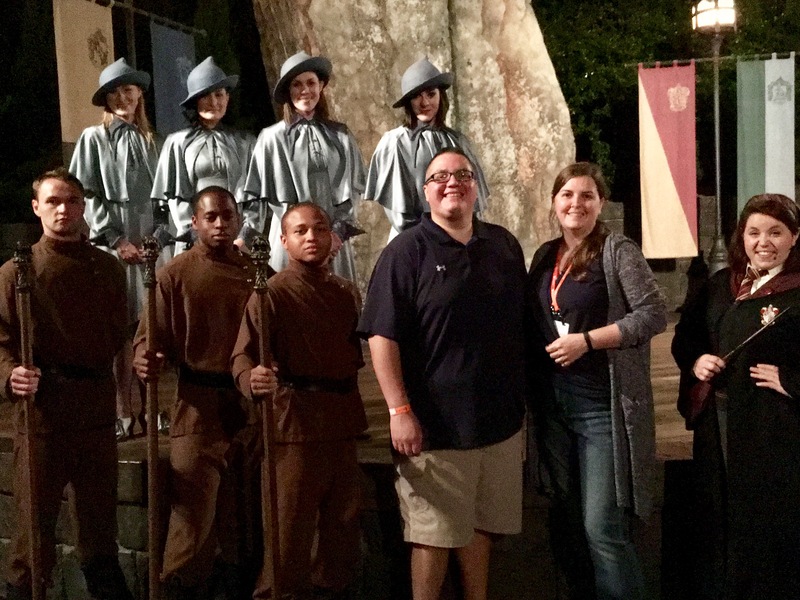 One great thing about the Wizarding World of Harry Potter and, I assume, all of Universal Studios was that the people there, the staff, are in character non-stop. To skeptics, I’m sure it’s a little (or a lot) hokey, but I thought it was really fun. We heard several references to Muggles included a storekeeper who referred to my credit card as Muggles plastic. It was cute and it really added to the experience. When we were all done, we had enough time for one last spin around the alley before walking back to where the shuttles would pick us up. We left the Wizarding World of Harry Potter with smiles plastered on our faces and we couldn’t stop talking about how much fun we’d had. We got back to the hotel and ate marketplace food past midnight, but it (and the lack of sleep) was all totally worth it!